The term “Protea” is sometimes loosely used to refer to any plants in the Proteaceae family; though the scientific name Protea is strictly confined to one genus. Even nurserymen and cut flower growers the world over, may sometimes use the term Protea to refer to related plants in the Proteaceae family, such as Telopeas, Leucadendron and Leucospermum (though strictly speaking they are not Proteas). This course is primarily concerned with those plants classified scientifically into the genus Protea. This is a course for amateurs and professionals; flower growers, plant collectors and breeders, nurserymen, botanists, landscapers, gardeners and horticulturists. 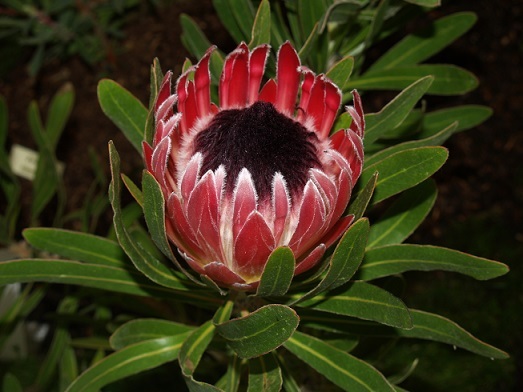 How to grow Proteas for commercial flower production. The botanical characteristics and cultivation requirements for a selected Protea cultivar. A collection of different Protea cultivars on a budget equal to an average one weeks wage for workers in your country. selection of the varieties to grow, how to establish them in containers, how to maintain peak health throughout the year. Month by month what to do to proteas to achieve and maintain peak health in your garden. You should indicate when to feed, how much & what, when to prune, and how, when & if to mulch, pest control measures etc. Proteas come from southern parts of Africa, and mostly from South Africa. There are around 136 species of Protea, more than 80 of which are indigenous to the southern Cape Province area of South Africa. Around 35 of the remaining species are from tropical Africa, and the rest are found between these extremes. Protea flowers are bisexual. That is, both male and female reproductive parts are found in the same flower. The flowers are irregular, with many arranged in heads which are usually sessile. Heads are solitary, and flowers are enclosed in involucres of variously coloured, imbricate bracts. The fruit is a densely bearded nut. It is the colourful bracts that are very showy – the flowers themselves are generally insignificant. Most need good drainage and can be susceptible to poor drainage. Many are good as cut flowers. Many have a lot of nectar produced in the flowers; which in turn makes them attractive to birds, insects and some other wildlife. Many can be pruned relatively hard, and if healthy will grow back strongly. In appropriate conditions, most Proteaceae will live well beyond fifteen years - some, although only a minority, will live beyond 100 years. Many will grow well without a high level of soil fertility - but there are exceptions. Most will propagate from seed - many will also propagate from cuttings. Proteas are and other Proteaceae plants are relatively resistant to many health problems, apart from root rots associated with bad drainage; however there are about 200 known pests of proteas. Whilst many of these are only found in the plant's native country (Southern Africa) there are a number of pests and diseases in other countries which will affect the quality of the crop if grown there. The most troublesome pests and diseases are those which damage the foliage and stems or those which don't actually cause any damage but are often found on the flowers (e.g. spiders, earwigs and ants). These problems can significantly decrease the quality of cut flowers, especially for the export market where demand for good quality flowers (especially in Japan) is extremely high. Control of weeds around the base of plants - in the field this will reduce insect populations close to plants. Chemical spraying using insecticides and fungicides - selection of suitable sprays and equipment is obviously very important. Some chemicals may damage the flowers, others may be illegal in your country or region. Other cultural procedures such as pruning to allow maximum spray penetration will also be helpful. Using clean, healthy nursery stock - choose only plants which have unblemished foliage, vigorous growth, and are not suffering from any obvious signs of stress (e.g. stunted growth from lack of water, light, or appropriate temperatures, etc). Quarantine inspections - flowers for the export market are rigorously inspected and infected flowers are either completely rejected or fumigated before being released to the markets (which results in a subsequent deterioration in the flowers). Pests which commonly occur on Proteaceae plants vary from country to country in accordance with native insect and animal species.